How can this possibly be the LAST day of July?!?!? I honestly don't know where the year has gone! Time is flying by too quickly and on that note, I am going to share a card I made tonight for my PRECIOUS, First GRANDdaughter, Miss Addison Lee. She is going to start Pre-K on Monday. It is a bittersweet moment for all of us. She is such a funny, inquisitive, friendly and precocious little girl that will be a delight for any teacher! When I spend special time with her, I realize how much I miss teaching! Red and White Gingham Ribbon and a Blue Button from my Scrapbooking supplies. Please take a minute and like my Facebook page. While my one year old GRANDdaughter took a nap this morning, I was able to sneak in my craft room for about 30 minutes. I came up with this quick card idea and thought it would be great made in several different colors for a note card gift set. Hope you enjoy the bright summer colors. Tools: Stampin' Trimmer (126889), Tempting Turquoise Embossing Powder (122950), Heat Tool 9129053), Big Shot Cutting Machine (113439), 1 1/2 inch Circle Punch, 1 1/4 Circle Punch (119861), Floral Frames Collection Framelits (127012), Snail Adhesive (104332). I received a large box from Stampin' Up! last night, so after sorting through all my new treasures, I decided to use a piece of my new Witches' Brew Designer Series Paper. I love the whole pack of paper and decided the chevron piece would be perfect for this card. Stamp Set: Feels Good (131916 wood) (129684 clear) I love this stamp set. It is a go to for me! I wanted to share a happy card today! This is a new stamp set from Stampin' Up! It is called Flower Shop. It coordinates with the Pansy Paper Punch. It is so much fun to stamp and there are sooooo many great ways to use this stamp set. Hope you are having a bright and sunny day! No rain today in Georgia!!!!!!! WOW! 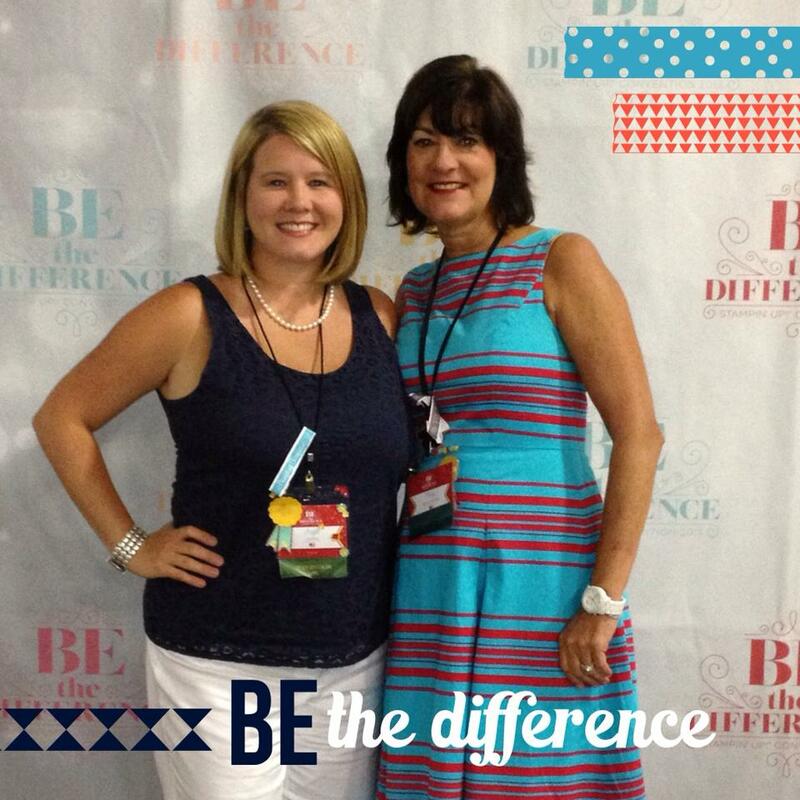 What a fabulous few days in Salt Lake City for the 25th Stampin' Up Convention! I don't think I have ever experienced anything quite like it. 5,800 women sharing what they love is a contagious environment! I am thrilled to be part of Stampin' Up! and LOVE the the company and products even more! I am thankful to have met many amazing women! Here are a few pictures of my experience. Angel Johns is my upline! She is my special friend, too! My Stampin' Up! Family! 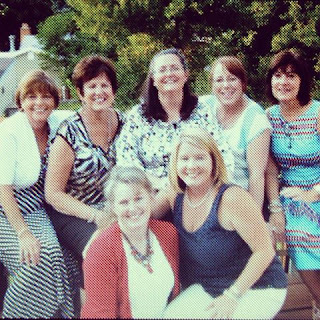 Carol, Judy, Sheila, Leslie, Angel and Laura. We had such a great time together! A huge thank you to Laura and her parents for hosting a special dinner on the last night of convention!!!!! I found my special friend and neighbor, Margaret, at the Convention! Pam Barbara and Pat were part of the fun in Salt Lake City! The trip to Riverton to see the Stampin' Up! Headquarters was impressive! Now that I am home and rested, I am ready to share Stampin' Up! with everyone! Check out the new holiday catalog by visiting the link on my website. Hope to create a card/cards today! I am rushing to get several things completed before I leave for Indiana to visit my Mom and attend the Jessup Family Reunion on Sunday. I am flying back to Atlanta on Monday and then off to Salt Lake City, Utah for the Stampin' Up! Convention. I made this card to send from the convention. They are going to try to break the GUINNESS WORLD RECORDS for the most greeting cards sent from one location. I am sending this to my Mom because she LOVES hummingbirds and the color green. Same colors and papers as front of card. Wishing you a very special day! WOW! What a busy weekend entertaining family over the Fourth of July. It has been so rainy in Georgia. We were able to get out on the boat for a few hours between downpours. I did manage to sneak a few minutes in my craft room to create this card for a very special friend. I hope all of you will find a few minutes to do something you love! I just returned from four rainy days at Amelia Island, FL. My plans to relax, walk on the beach, and attend the Shrimp Festival were not what God had in mind. I now know how Noah felt on the ark. I was very happy to be able to work in my craft room today. I needed to make a birthday card for a special friend, so this is what I created. The card was created using Midnight Muse cardstock (126843). Cut the base 5 1/2 X 8 1/2 and score on 4 1/4 using the Stampin' Trimmer (126889). The second layer is Summer Starfruit cardstock (126839) and the top layer is Whisper White cardstock (100730). I used the Delicate Doilies Stamp Set (122592) Clear and (128541) Wood. I used Midnight Muse ink (126860), Summer Starfruit ink (126991) and Gumball Green ink ( 126861) to stamp the different doilies. I then embossed the white layer using the Fancy Fan embossing folder (127751) and the Big Shot machine (113439). I stamped a Midnight Muse doily on scrap paper and punched it out using the 2 1/2 inch Circle Punch (120906) and popped it using Stampin' Dimensionals (104430). I stamped Happy Birthday using the new Hostess set Banner Greetings (129714) Clear (129711) Wood in Gumball Green Ink. You can earn this stamp set if you host a party for Stampin' Up! I used Stampin' Dimensionals on the banner, too. I added a few Pearls (119247) on the doilies. On the inside of the card, I used Whisper White cardstock (126843) and stamped random doilies. I also stamped the sentiment from Vintage Verses (129636) a stamp set from Sale-A-Bration. It is almost the holiday weekend and twelve members of my family are coming to visit us. Since we live on beautiful Lake Oconee, we were planning boating and swimming activities plus fireworks. Well, the forecast is very gloomy for that to happen. We are supposed to have 2-4 inches of rain. I would like to think the weather-people made a mistake, but I don't think that is the case. Hopefully, we can just enjoy being together and I see movie watching in our future. Unfortunately, all too often we need sympathy cards. I created this simple card for a very special friend. Wishing everyone a WONDERFUL Fourth of July weekend! Enjoy time with family and friends! I had a full day of working in my craft room yesterday. I used another new Stamp Set and Embossing Folder to create this card. It is the Mosaic Madness Collection! I love it!!!! Please shop my online site: www.clairecreatescards.stampinup.net to find the new products that Stampin' Up! offers. This card is a great way to use paper scraps. Hope it brings a smile to the person I am sending it to! CASE-Heidi King---THANKS for the inspiration!